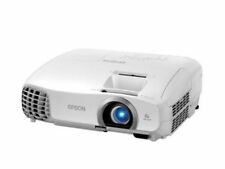 Epson EX3220 3-LCD Projector Home Theater HDMI - 3K Lumens H552A. Condition is Used. Shipped with USPS Priority Mail. Supports 1080P, 720p, 1080i resolutions! TESTED TO POWER ON AND FUNCTION. WORKS GREAT! NOT NATIVE 1080P! -HDMI CABLE. THIS PROJECTOR WILL WORK WITH --BANQUET HALL OR CONFERENCE ROOM. NEW BULB INSTALLED! Mitsubishi WD570U DLP Projector. Mitsubishi WD570U Special Features ⦁ HD Video Mode: 1080i. ⦁ Display Type: DLP. - Computer-free Presentations (PTG file/JPEG Viewer). ⦁ Projector Weight: 8.4 lb. Projector is Professionally Tested and is in Good Working Order. Model # PJD7820HD. 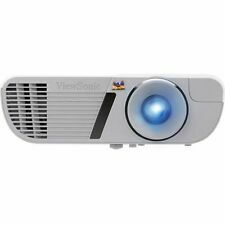 Viewsonic DLP Projector. This projector features Full HD 1920x1080 (1080p) native resolution for the sharpest and clearest picture available. Designed with two HDMI ports, this projector is perfect for connecting to any HDMI-enabled device, and can display 3D images directly from 3D Blu-ray players. This item is used and in good condition. It currently needs a bulb put in, but has been tested and is working. Included with this device is the power cord, VGA cables, manual & CD and a carrying case. Dual lamp operation: lamp 1 - 984 hours, lamp 2 - 984 hours. Projector is in great working order and has excellent picture quality (see photo of lamp hours). This projector is in great condition. There are a few minor scrapes and scuffs on the top of the chassis, but nothing that affects operation. Acer H7550STz 3D DLP 1080p Short-Throw Projector. Condition is Used. Shipped with USPS Priority Mail. Projector is like-new, used only 12 hours for burn-in testing and working flawlesy. It comes in the original box with all original acessories and documentation. 2 pairs of 144Hz DLP-Link 3D glasses and wireless HDMI kit are included. Spectacular Presentations Made Easier. The EX3210 automatically corrects the image vertically. Your EX3210 can be off to the side and above or below the screen, while your presentation is front and center. You are purchasing a InFocus T104 Projector. This has been tested and working. Good used condition. Light wear from normal use. Has 488 hours on the lamp. No Remote is included. This item includes the power cord and remote but does not include other accessories. the item is lightly scratched, scuffed and has light dust around the lens and connection ports. The projector has been tested and is in overall good working condition and ready for use. This item has been successfully tested for power on/key functions and is R2/Ready For Resale. Carrying Case Included (Pictured) . Local pickup is available. The item exteriors may have minor scratches, scuffs, dents, cracks, nicks, etc. You are purchasing a BenQ MP610 Projector. This has been tested and working. Good used condition. Light wear from normal use. No remote is included. Has around 2000 hours on the lamp. FREE Accessories Included by TeKswamp for your convenience TeKswamp Warranty. Display Type: 3LCD. HD Video Mode: 1080i. Projector Weight: 7 lb. 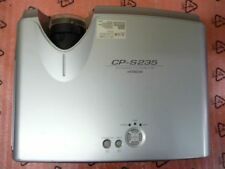 "Professionally-Refurbished Projector in Perfect/Excellent Working Condition. This has been tested via the VGA port and it is in good working order. Includes working lamp and power cable. Item is in good physical condition as pictured. Unless otherwise stated, this has been tested for key functionality. Supported Resolution WUXGA (1920 x 1200) @60Hz. The technology inside is often referred to as DMD (Digital Micro-Mirrors). For example, a high-definition DLP projector or rear projector with 1920 x 1080 pixel resolution would have over 2 million tiny mirrors. 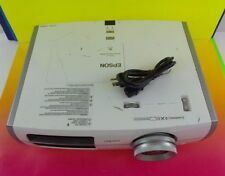 Mitsubishi XD600U DLP HDMI Video Projector Lumens 3D. The bulb recently went out on this projector and will need to be replaced before it is usable. Model: H330A. This projector is used and is in good working order. The power cable and lamp are included, but the remaining life/hours of use are not known. Test Results: Tested for key functions. Electronics Cafe specializes in used electronics. Brilliant image quality requires high color brightness. Make an even bigger impact with the built-in microphone and premium speaker, featuring sixteen watts of powerful sound. It's all possible with this affordable, high performance projector. This has been tested via the VGA port and it is in good working order. Item is missing filter. Includes working lamp and power cable. All functions of the projector have been tested and are in great working order. Tested for full functionality. R2/Ready for Reuse. Standard signs of use. See photos for more detail. Includes only what is pictured. Power cord included, no other cables or accessories. No remote. This is a used unit with approximately 290 hours. NO FURTHER TESTING DONE; TECHNICAL SPECS MAY REFLECT THE MANUFACTURER SPECS ONLY! All freight must be pre-paid for acceptance. ONLY TO US TERRITORIES!